“3 Days to Lazarus” A new published novel | Marbella Marbella – Adelante! 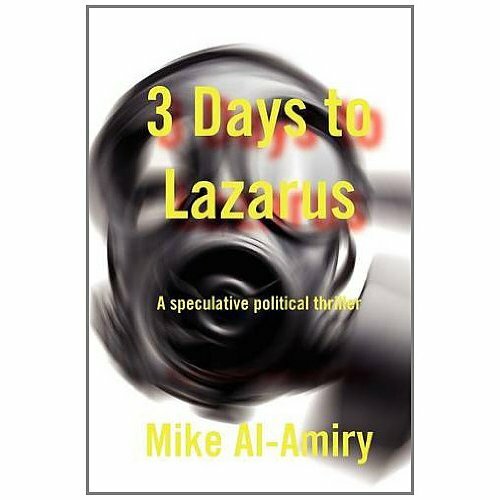 A personal introduction to “3Days to Lazarus” from author Mike Al-Almiry to our visitors and contributors. With regards to your interest in my recently published novel (3 Days to Lazarus), I’d like to share with you and your other guests: a story behind writing a story. I, like every visitor to Marbella-Marbella-Adelante, find this site as refreshing as a cold drink in the shade on a hot summer’s day; a place where we can escape from everyday toils, the constant flow of bad news, and a consistent torrent of meaningless twaddle by Machiavellian politicians with silver tongues. Babies are at their happiest when enfolded by their mothers’ arms whilst listening to that familiar comforting rhythm of her heart-beat; they reach-up with pudgy little hands to touch the smiling face looking adoringly down at their own, and contentedly listen to the soothing sounds that issue from the smile. All that matters, exists within the safe-haven of mummy’s arms, but should their ears or eyes pick-up any sound or sight outside of that safety zone, their attention is immediately drawn to the source; and this is human nature at its most primal and with its most basic instinct. It was those two very words, which grabbed me by the collar of my pyjamas, dragged me roughly to the gap between the curtains of my safe-haven lounge, and made me take more notice of the outside with the subtlety of a sharp slap across the face by a heavy hand. I at first thought to myself (so where’s the harm in that..?A world free from starvation, disease and conflict; a world of fraternal empathy and mutual cooperation…) and then carried on whistling John Lennon’s immortal tune to the equally immortal lyrics of the song “Imagine”… Everything then turned on its head, when these same world leaders using the same colourful banner, created false pretexts under which they mounted fearsome armadas and shipped them thousands of miles off their own shores, to wage wars and proudly inflict shock and awe upon people who could barely change their own diapers if they had any. A finger in my mind pushed the rewind button of history and replayed images of one of mankind’s gravest follies. Whether in metaphor or reality, a sharp slap is often the best means of awakening one from one’s slumber, and I began to hear the real words behind the politicians’ rhetoric, to see the real faces behind the veils of benevolence, and to feel the apprehensions behind the Anti-globalism and Occupy Wall Street movements. I also began to understand the motives behind the bankers and corporate elites control of elected politicians, sometimes even shunting them aside and directly taking their place upon the very thrones they were elected to. Can it really happen..? Are we racing headlong towards a world governed by bankers and ruled over by corporate demagogues? A world of people who are rendered asleep by the lullaby of a sham democracy sung by greedy manipulators without a single democratic gene in their DNA! The answer came at me like an upper-cut from Mike Tyson. The above line became a subtitle to a book, and 3 Days to Lazarus was born in my mind when those two whispered words “what if…” suddenly became a loud shout that could not be ignored. I created a backdrop of a federal world, unified by a single government as described above, and then let the story unfold at its own natural pace. The emerging storyline tells of a fate of virtual enslavement for the whole of humanity, but mankind has thrived on challenge, prospered by need, and progressed through conflict. The world we know is imperfect, but it is completely symbiotic with mankind’s own imperfections; humans are born to be free and would willingly lay down their lives for that freedom. 3 Days to Lazarus is a 72 hour count-down for the awakening of humanity from catatonia to revolution. Now available at Amazon Books and other retailers worldwide.